The Word receipt template is a great alternative form to use if you don’t have Excel, or don’t like using Excel. Microsoft Word provides the option to include a table that can perform simple arithmetic calculations, such as adding, which is what has been used on this template for adding the total value of coins and cash, and which saves you time having to do the calculation yourself. Below is an example of a completed receipt based on this template. 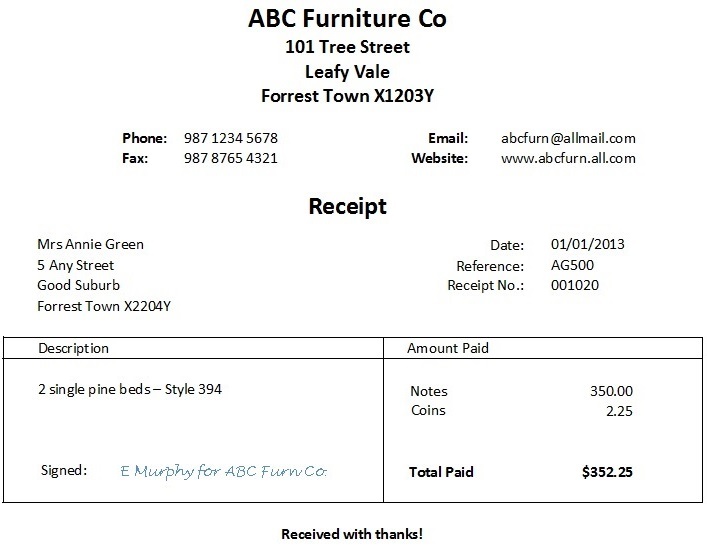 Use this receipt any time you have to give one to a person or business that pays you cash for your goods or service, or rent – you might also like our rent receipt template, although it is in Excel and PDF format – there is no Word version available right now. Download the file, and save it to your computer in a folder that you can locate again easily. Because this word receipt is a template, when you make changes to it and then go to save it you will be prompted to save to a new document. That way your original template stays intact exactly as when it was downloaded. This template has text fields. Use the ‘tab’ on your keyboard to move around inside the document to the different fields. When you do this the fields are highlighted (as can be seen in the diagram above) and you can start typing in the details relevant to your transaction. By highlighting and typing you automatically replace the template detail with your detail – no need to delete or backspace out the template detail first. If you need to use your mouse pointer to click inside a field you can but this does not highlight the whole field. You can do this by clicking on the dotted tab on the left as seen in the diagram below circled in red. In the ‘amount paid’ column just tab to the 0.00s and type in your amounts but you can leave the total for now because we are going to do the automatic calculation. You will see the ‘Chose an item’ which lets you pick between checks or cheques depending on which part of the world you are from. To calculate the total press ‘Ctrl + A’ on your keyboard which highlights everything and then press F9. This adds the coins, notes and checks/cheques). Once you have checked your receipt and you are happy with it, you can print it. Press Ctrl + P or your printer icon to print the receipt. Sign it on the bottom left. Keep one in your folder and give one to the person who paid the cash. Of course, if you like to save paper, just save or print this receipt to a PDF document or Windows image and email it to the payer, and save it to your computer or online electronic storage.